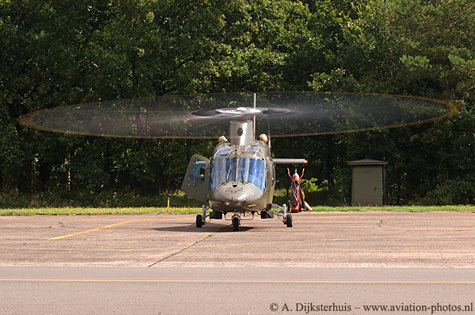 The Operational Integration Exercise (OIE'07) was held at Kleine Brogel, Belgium between 16 and 18 July. 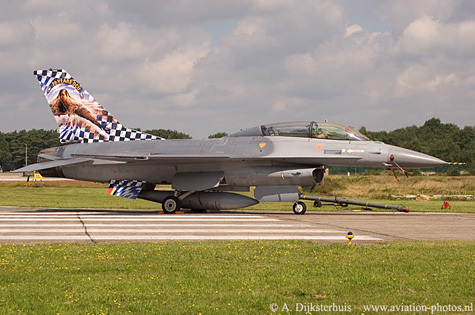 Kleine Brogel is well known for their spottersdays in the past and they did it again! So many participants from several countries could be seen and photographed on the ground and is the air as well. A small amount of them can be seen on this page. The weather turned out to be good, which made it a good day for the photographers. One of the highlights was this Spanish Air Force F-5M with serial AE.9-010/23-04, which is operated by Ala 23. 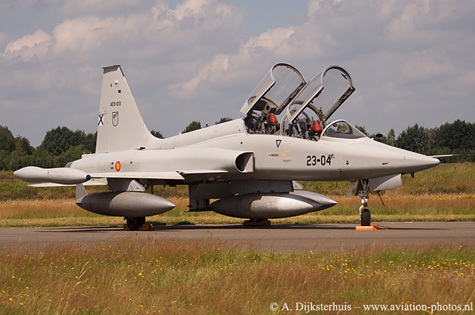 Besides Spain, two more countries in Europe (being Switzerland and Turkey) still operate, with several versions of the F-5. How often can you see six aircraft from the Hellenic Air Force outside Greece? Three different types could be seen in action that day. Real (!) aircraft like this A-7E Corsair with serial 160560, is seen here while making an overshoot after the mission. A two-seater TA-7C flew as well. Both are operated by 336 MV. 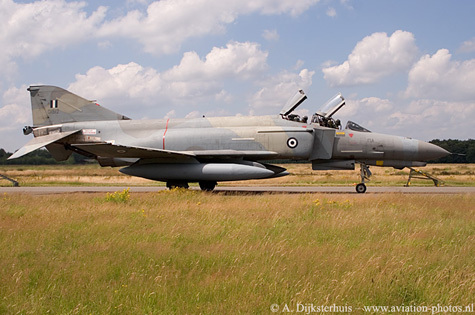 Another phabulous aircraft in the inventory of the Hellenic Air Force is the F-4(AUP) Phantom. Two were present at Kleine Brogel. One of them, with serial 01512 is seen here in the middle, while taxiing after it returned from the mission. Last but not least, a pair of F-16Cs participated as well. F-16C with serial 119 seen on the right. 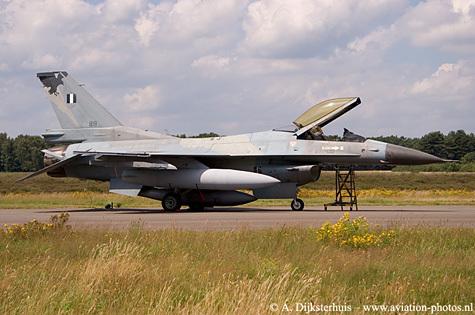 The Turkish Air Force participated in this exercise with a pair of F-16s from 192 Filo. Both with a tiger-fin and a tiger being applied on the tail. 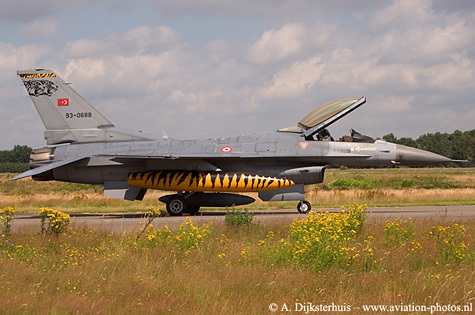 The fuel tanks, carried by the F-16C with serial 83-0688, received a full colour tiger livery. 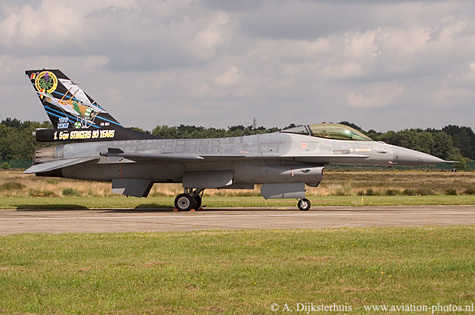 The Dual seater, F-16D registrated as 93-0695 is seen here with the fuel tanks in the toned down tiger livery version. 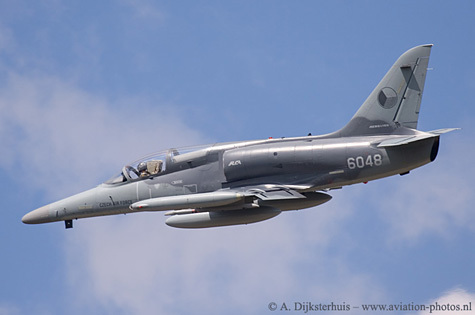 The Czech Air Force participated in the Operational Integration Exercise with three L-159A aircraft and three JAS-39 fighters (two single seaters (JAS39C) and one JAS-39D) The Alcas stayed at Kleine Brogel for a longer period, they participated in the Sanicole Aishow. L-159A Alca, with serial 6048 is seen here in take off for a mission in the morning. 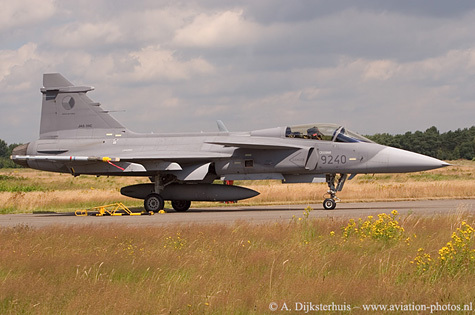 On the right the 9240, a JAS39C, operated by 211.tl. 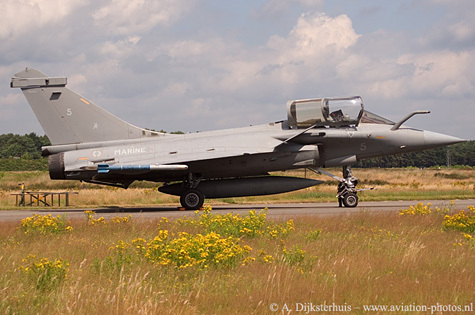 Not one, not two, but six Rafales were present at Kleine Brogel! 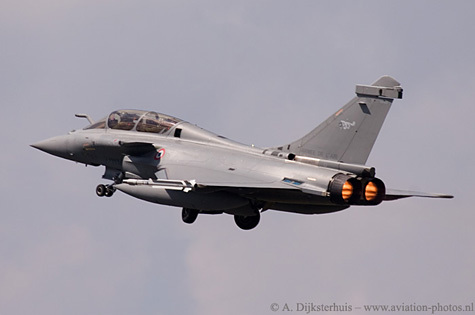 The Rafales are the newest fighters in the inventory of both the Aeronavale and the Armee d l'Air. The Aeronavale participated with four Rafale M fighters operated by 12F, among them was this example with serial 5. A couple of Rafale C fighter from the French Air Force (EC01.007) were present. Rafale C, serial 318/7-HM, is seen here in take off with full afterburner. Although you can not clearly see the difference between these two versions of the Rafale as depicted here, but when they are parked next to each other, you will notice that the Rafale M (the naval version which is operated by the Aeronavale) has a different nose wheel, making it suitable to operate from an aircraft carrier. 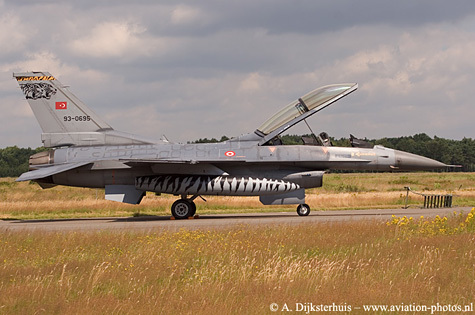 The nose-angle is in a more upwards position than the Rafale C.
Besides of the F-16s from Danmark, Greece and Italy, a large amount of Belgian F-16s could be seen at Kleine Brogel. F-16AM with serial FA-101 is seen here with a special tail. 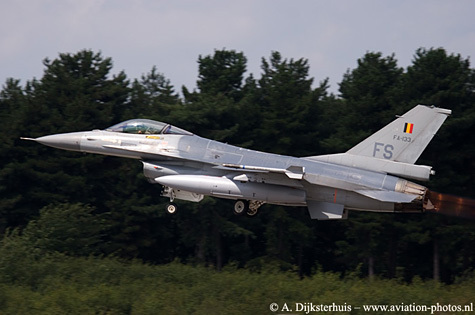 F-16AM with serial FA-133 and code FS is seen here during take off with full afterburner. Below left is the FB-18, a F-16BM with a special tail celebrating the 20th anniversary of the OCU unit. 'The last of the many'. The Fouga CM.170R is phased out by now. The last remaining Magister, with serial MT-35, made a display at Kleine Brogel. Actually one of the last displays that was scheduled for this particular aircraft. A farewell party was held at Beauvechain in September. Another era came to an end. 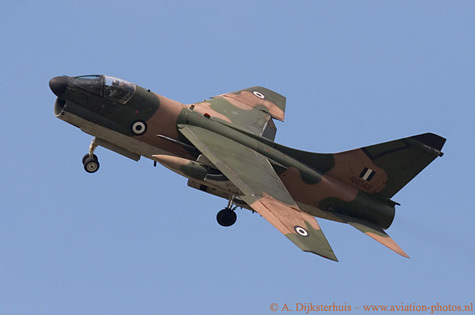 The Magister will surely be missed at airshows all over Europe. 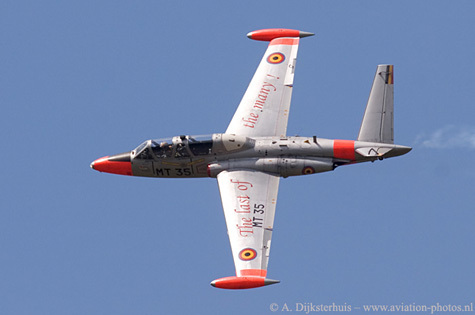 Farewell Fouga CM.170R Magister! 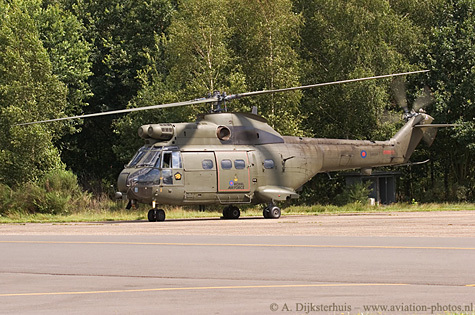 Two Puma HC1s were at Kleine Brogel. Both helicopters were parked on static display during the Royal International Air Tattoo at RAF Fairford, UK, on the Saturday and Sunday. Just a few days later they could be seen in Belgium. One of them, Puma HC1 with serial ZA939, participated in a CSAR demonstration together with a couple of Agusta A.109BA helicopters. The H22, is seen here during the start up on the flight line, prior to the CSAR demo (Combat Search And Rescue). It is seen here with the main rotor in a full circle. It was again a great day at Kleine Brogel. Thumbs up to all involved to make this event possible!